Cats unlike dogs are their own person. I am content to let them just be cats so I do no name them or do I force affection on them. They seek me out or the don't. While I have great affection for them, it is not the same as for my Great Dane, Heidi. In the country, cats that are free to come and go outside tend to have a short life. There are many predators in the wild kingdom. My three kittens on the shelf beside my computer. It is a quiet vigil. "Mother Cat" the only one with anykind of name is usually quite aloof. Recently, she has moved to be very close to me and taken to lying so that it is hard to use the keyboard or my mouse which I usually use on the left hand side. She is pregnant, which explains her neediness. I am tempted to give her some effleurage massage on her belly. I have prepared a nesting box for her, which I hope she will use. One cat prefers to curl up on my right arm. While it makes computing difficult, I try to be partient and let her decide when she want to leave. If Heidi thinks it has been long enough, she will come and try to put her face in my arms. I am in no hurry. Life at my age is fast enough without my efforts. 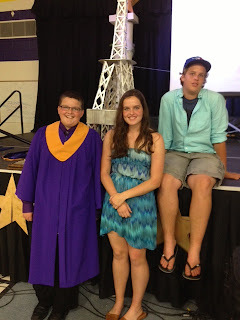 The third and last of my grandchildren graduated from elementary school yesterday. 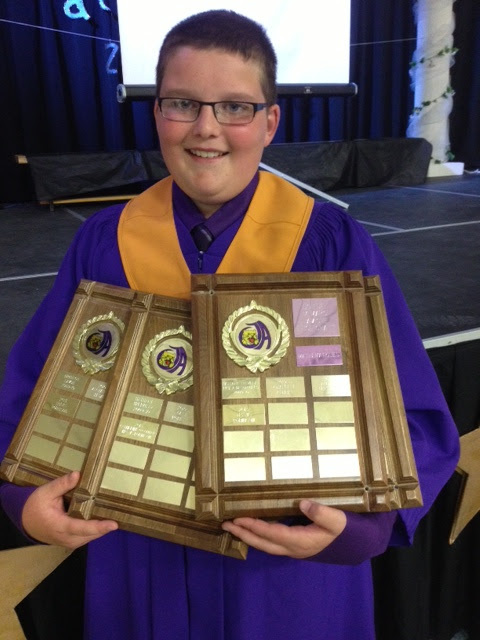 Travis makes us all proud by being an excellent student, as well as a lovely person, just as his older brother, Dillon and sister Olivia have are. All three have also been involved a sports over the years. Travis is a great reader and this year joined a cadet corp and plays a drum in their band. He is also interested in magic and likes to put on small magic shows to amuse us. Travis won awards for top marks in math, computer, english and french. If you were going to excel in anything these four subjects are important ones which prepare one for further academic success and even possible career goals. I have yet to hear whether he will contunue his secondary school studies in english or french. As I have mentioned before my three grandchildren attended the french language public school, Ècole Publique Jeunesse Active. French is their second language although they certainly are fully bilingual now. I am particularly impressed that he won the french award, just as his sister did before him. Dillion chose the continue his schooling in english while his sister is continuing her's in french. Whatever his choice I am sure he will continue to excel. I think the school will miss the Robinson family. They are one of the few English family to enrol their children in the french language public school. They have good student, a credit not only to their parents but also the teachers they have had. Last week I was looking through the TV movie offering for the night when I saw "Welcome to the Sticks" Since where I live has often been referred to as the sticks, I thought it might interest me. I read the two line blurb about it and realized I know this movie. I learned about it when I was researching about the Picard language. It is a very popular French film, " Bienvenue chez les Ch'tis". It is a comedy about a Paris postal worker being transferred north to the Nord-Pas-de-Calais region to a small town near Dunkirk, Bergues. He does not want to go to this area for many inaccurate reasons. He reluctantly goes and ends up really liking it. In this region of France, historically the people did not speak French. They spoke Picard another Romance language related to French. Across Northern France Picard is still a spoken language. It has other regional dialects such as Walloon. The Belgian "French" are known as Walloons. In France much of this Northern Region has been know as Picardy and most of of Belgium "French" area, Wallonia. In the area of Picardy where the postal worker is sent the Picard speaking people speak a dialect know as Ch'ti. They are called this name and southerners also refer to them as Cheutimi. It is all very confusing. There are even other more local dialects or patois.spoken. This is a very funny little film which is one of the most successful films in France. It has been adapted to Spain and Italy using the regional and language differences in those countries. The story could well be adapted to Ontario. People is Toronto, the South, often refer to the North as the area of cottage country up to 75 miles north of the city. Beyond that and into Northern Ontario, the real North, is a wasteland for them. It is the sticks and many wonder why anyone would want to leave in that marginal world beyond easy reach of the city. Like in the film they see Northern Ontario as cold and wet and the people are ill educated and many do not speak English but French or even Ojibwa/Cree. Perhaps, someone will write a Canadian version of this funny story. Language fascinates me in spite of the fact that I have never mastered a second language. I believe it is true that "Culture is Language". With many languages around the world going extinct, I think it is important to try to preserve minority languages and even minority regional dialects. In France, not everyone speaks French in spite of there being only one Constitutionally mandated language in that country. In recent times, with pressure from the European Union, France has made some modest efforts to support or at least allow regional minority languages short of giving them official status. In French, there are about 75 regional dialects including minority languages within France and it's overseas territories. 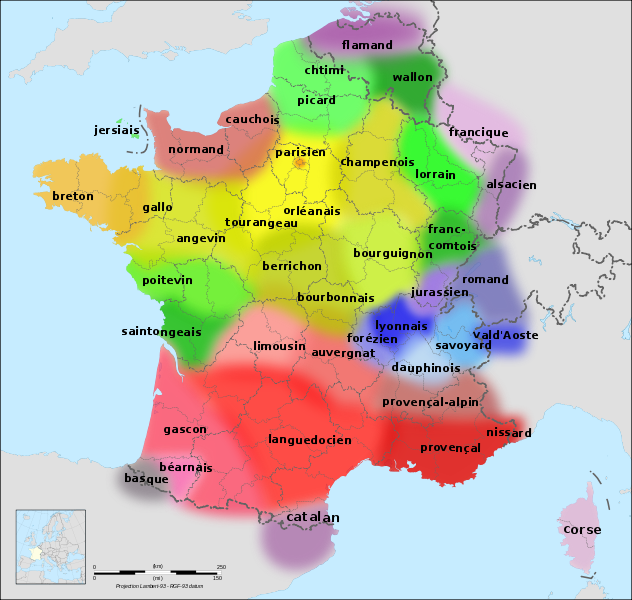 Within France alone there are 24 such regional languages. Picardy, I have mentioned. There is Norman, which was brought to England and for a few centuries was know as Anglo-Norman, the language the wealth and well educated spoke. There is also Breton which is not a Romance language. It is Celtic. There is also in the south Occitan which had a well developed literature even before there was France. At the time of the French Revolution only about 1/2 of the French citizens spoke French and as late as the 1870's only about 1/4 spoke French as their mother tongue. It has long been the policy of France to suppress minority languages and make only French from the Paris region the one an only official language. It is an interesting list of languages of France, each with a story and a cultural significance. I encourage you to explore the language map of France and google about the minority languages. many are at risk of disappearing. The United States, like France, strongly supports the notion of their being only one official language. In recent years with the increase in Spanish speakers some states have even chosen to make it law that only one language is used in business, the law, and politics. It is my contention that this is wrong headed. The United States is de facto a bilingual country. They should embrace this and accept the added richness that a second culture would bring. There are so many Spanish speaker in the US that it is possible to live in Spanish in many communities. The Spanish speakers are more reluctant that other immigrants to totally identify with American English culture because of their numbers and that they have so many Spanish speaking countries along the Southern Borders that they can relate to. I have always found it sad that French speakers in the New England were made to feel ashamed of their language and culture. Many had come from Canada to work in the mills of New England. Some historically were rooted in the lumber industry in the North and passed easily back and forth with the industry in Quebec and New Brunswick. There are also people of French origin in New England of French Huguenot protestants who were prevented from going the French Catholic North America. The Acadian French in Louisiana hang on locally and contribute their rich culture to that part of the US. There are even other language and cultural groups in the US such as German speaker, but in spite of hanging on culturally they are at risk of disappearing culturally. As a Canadian I am glad Canada has taken another approach to minority language and culture. For years, the policy was much like that of the United States. French in Quebec was a special case but even their French Canadians were made to feel second class. When Canada, under the threat of Quebec Separation, established the policy of official bilingualism and biculturalism, only a few decades ago, we moved in this different direction which not only supports more tolerance but also makes available to us all more culturally rich experiences. In some regions of Canada governments have taken up the challenge and tried to follow the Federal governments lead and even move beyond it. Political areas of the North such as the Yukon, Northwest Territories and Nunavut have 5 to 7 Official languages and conduct official business in them all:: English, French, 2 Inuit languages, and several other aboriginal languages. In some Provinces, education in minority languages is increasingly more available, and government services are available in the 2 official languages. In the courts, federally, one can demand they be conducted in French or English. Translators are available for other languages. The French out side of Quebec were written off by the Quebecois Separatists. They did nothing to reach out to French Canadians outside of Quebec. It was the majority of Canadians through the Federal Government and the Provincial and local governments who came to support these minority French Communities strengthening the use of the French language, cultural institutions and French schools and universities. Even bilingual signage, which my friend Lynne continues to point out as a waste of money, particularly when virtually every French Canadian in my area is bilingual. Not to mentions two small high schools, one French and one bilingual.. Such support of French culture and language is not for convenience it is for respect for the community and its culture. In my village, in spite of the fact that all French speakers are bilingual we conduct all meetings in both languages. If convenience was the test they could be conducted in English, which everyone understands. In the long run, to do so, would just help doom the minority language even in areas like mine where it is in fact the majority language. When minority languages disappear a regional population loses its culture by denying it the sharing of a past but also stopping it from creating a future in it own voice. Of course, with fewer languages and cultures we are all deprived of the richness of human civilization. "Welcome to the Sticks" is a film about tolerance, acceptance and the joy of sharing in another culture. It was fun to watch, Oh how I wish I could watch and understand in in French. In many ways she is remarkable. Hazel McCallion is the mayor of my home town, Mississauga, Ontario. She has been the mayor for 35 years, 12 times she has been reelected. She claims this is her last term but I would not bet on it. She is 92 and still intellectually sharp. The city of Mississauga was largely built to become Canada's 6th largest city under her leadership. It had been a rural area with a number of small communities. She was Mayor of one of them, Streetsville, before she became Mayor of Mississauga in its early days of amalgamation. Here are some historic photos. I post this blog article today, as a celebration, because she was found not guilty of a conflict of interest charge which could have forced her to resign.if she had lost. She deserved the shadow of a doubt. her administration has been largely free of corruption over the years. As a political character, she has been a force to contend with. She has come to affectionately be called Hurricane Hazel after the one hurricane that actually struck the Toronto area and caused great damage in 1954. It was also one of the worst hurricane in North Carolina before it crossed the Appalachian Mountains and headed for Toronto. For some, one of her remarkable accomplishments is that she oversaw the building of the city without incurring any debt or raising much higher taxes. I would call her politically a caring conservative. She thought a city should be run like a business but she also believed a city should meet the needs of all the people. Not only did they built the structures of a city but she saw that the city had adequate services for all the growing population: schools,hospitals, libraries, skating rinks, swimming pools, parks, waterfront development, etc Whatever her political abilities are, I think of all those corrupt decaying cities in the United States, like Detroit, which could learn something from our mighty mayor. If you think I am a fan you are wrong. She is the one that oversaw the destruction of the place where grew up, Toronto Township in the south end of Peel County. although the actual neighbourhood where Lynne lives and I grew up, is still lovely. I think the city is ugly but then again I think most cities are ugly. If she had not given developers a free hand I think she could have built a much more people friendly city. Up until now the development fees that went to the city have largely subsidized the building and maintaining of the city so far. Now that it is largely built, except for a decent public transportation system, the maintaining of the city may have to depend more on taxation. Another mayor may be the one to raise taxation and even borrow money like most cities do. I just learned that Hazel McCallion is a French Canadian. She was born and raised in Quebec. She married an Anglo, hence the British name. 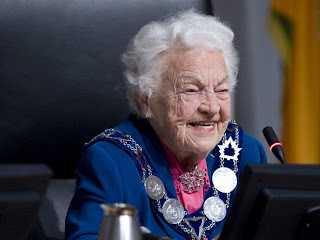 For a real appreciation of Mayor McCallion and, a few laughs, watch the video below, made a few years ago, when humourist Rick Mercer had her on his show.as they toured around the city. Yes! our Mayor had been a professional hockey player, in Montreal when she was young. She still carries her skates in her car just in case she has an opportunity to go for a skate. and shoot a few pucks. How Canadian is that! She has been a super star in municipal politics, few have been willing to face off against her, it is her puck and she will play with it until she decides to vote herself into the hall of fame and retire. I wish her a long life,. . .oh she already has that!. . . . well many bonus years for sure! I am not often inspired to do much on a cool and damp day. I am still cutting up my porch roof that the Winter snow load tore off making firewood out of it. It may heat me for a couple of weeks this Fall. I am nearly done but today I put off that effort do to the weather. I can hear some thunder now so I guess it will rain. Over looking my computer is one of my cats. She is the one that seem most closely bonded to me. When she isn't on her favourite shelf beside me, she can be found curled up in the crook of my arm as I watch TV or try to read. At night she is the one to first climb up on me in order to sleep on top. I guess she knows it is not a good day to go outside. Today, I get inspired to do a little baking. I do not do much of that these days. What is the point in a household of one. These are some tea biscuit with raisin in them. The jar is my window sill ice tea I like to have available when I do not feel like coffee. These are plain tea biscuits. It took me a while to realize that in the Southern US they just call these biscuits as in "gravy and biscuits". In the UK biscuits are what we call cookies. I made some oat meal cookies a couple of days ago as a little comfort food for me. Here is one of the loafs of bread I baked earlier. This is a Scottish Scone A wedge of it with butter is lovely warm, with a cup of tea. There is lots to nibble on tonight as I listen to the baseball game, Toronto Blue Jays vs the Chicago White Socks. 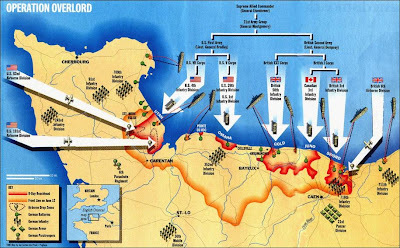 On D Day every year I take the opportunity to read more about this critical battle of WWII, the Normandy Invasion.to liberate all of Europe. It was an expansion of an invasion bgun earlier in North Africa and Italy. It was the beginning of the end. We must always remember that this was possible because of the dreadful price the Soviet Union paid in thoroughly defeating the German armies in the East. I always find each year new things about the Normandy campaign and am reminded of so many of the things I had previously read. It is a day worth remembering. Canada made a significant contribution that day as it did in the whole war. We need to remember that Canada's contribution was way above what could have been reasonably expected in manpower, equipment in ships and aircraft, and in treasure. Here is a list of Canada's remarkable contributions to WWI. I particularly appreciate an American site that praised Canada's contribution in the War.
. The Canadians were responsible for landing at Juno Beach. On each side of them were British troops on Sword Beach on the left and Gold Beach on the right. The Americans were landing at Omaha Beach and Utah Beach further westward. Canada landed successfully, taking many casualties in the frontal attach on the German fortifications as was the case for all countries' troops. Some things went right for the Canadians such as they got tanks landed which was not the case for the Americans. The British got delayed. As a result, Canada on the first day managed to move the furthest inland, in fact, some troops had to retreat a little because of the lack of allied British troop support on each side. The Americans had the most difficult time and took many casualties and almost failed to secure Omaha Beach. Many things went wrong for them that the troops on the ground had no control over. They also were faced with climbing a bluff overlooking the beach upon which the Germans were well dug in. It was a day to remember of all those that participated and survived. Below is a series of videos that are interesting in that so many aged veterans recall their experience of that day. On this day, I am also glad that Canada took advantage of the peace to shrink it's military. It had become a major military force in the world as a result of it's efforts in WWII. It chose to not become a major militarized society as the Americans did. We needed the peace divided and took. It has been sixty years since I watched the Coronation on TV. Could I be getting old? It is interesting to revisit the CBC's broadcast on that occasion to seem the personalities of the day and be reminded of the social changes since then. The Queen! Well she carries on with dignity and a life of service.